In 1981, Nicholas Hellmuth received two small photographs of a Maya hieroglyphic panel from the Guatemalan site of Cancuén (Kistler 2004). This was the last anyone heard of the panel until 1994 when it appeared on the art market (Kistler 2004). In 1995 the New York Times reported that a fifteen minute videotape containing images of the panel was being circulated among art dealers (Honan 1995). The piece reportedly had a price tag of $75,000 USD. The panel is extraordinary: 160 glyphs arranged in sixteen columns and ten rows on a slab of limestone 138 cm long and 94 cm wide (Kistler 2004). It was commissioned by lord Taj Chan Ahk, the same ruler depicted on a ballcourt marker from Cancuén (see Encyclopedia entry on the Cancuén Ballcourt Marker for more information about this object), and is a record of more than a century of the late history of the polity. It starts mid-sentence and was probably one of a pair of panels, the other of which is now lost (Guenter 2002). Conflicting rumours exist concerning the whereabouts of the lost second panel. 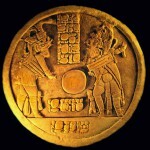 Some believe it is still buried somewhere at Cancuén or in a private collection somewhere in Guatemala (Guenter 2002). Others report that it may have fallen into the Pasión River during a dispute between looters (Kistler 2004). Citing unnamed local sources, Kistler reports that the known panel was once part of a throne: it formed the back of the thrown and the lost panel formed the seat. Warning that her information is not verifiable, Kistler relates that a canoe carrying both pieces capsized and, because the seat of the throne was the heavier of the two pieces, it sank to the bottom of the river and could not be recovered (Kistler 2004). Kistler believes that the two panels were looted sometime during Guatemala’s 35-year civil war by members of the military and that the surviving panel was hidden until 1994, when it was offered for sale (Kistler 2004). She notes that military and guerrilla troops were operating in the deep jungle at that time and would have had access to various archaeological sites. 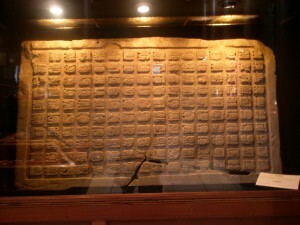 As of 2004, the panel was in a private collection and was being displayed in the Museo El Príncipe Maya, a private museum in Cobán, Guatemala (Fahsen and Jackson 2003; Kistler 2004). The owner of the piece and the details of the sale in which it was acquired are not publicly known. Fahsen, Federico and Jackson, Sarah E (2003), ‘Nuevos datos e interpretaciones sobre la dinastía de Cancuén en el periodo Clásico’, in J.P. Laporte, H. Escobedo, and B. Arroyo (eds. ), XV Simposio de Investigaciones Arqueológicas en Guatemala (2003; Guatemala City: Museo Nacional de Arqueología y Ethnología), 784-93. Guenter, Stanley ‘A Reading of the Cancuén Looted Panel’, Mesoweb http://www.mesoweb.com/features/cancuen/Panel.pdf, accessed 23 July 2012. Honan, William H. (1995), ‘Art for Whose Sake? : Trading in Antiquities; Rare Pre-Colombian Relics, at Any Cost’, The New York Times, 13 July. Kistler, S. Ashley (2004), ‘The Search for Five-Flower Mountain: Re-Evaluating the Cancuen Panel’, Mesoweb. http://www.mesoweb.com/features/kistler/Cancuen.pdf, accessed 23 July 2012. Hellmuth is the Director of the Foundation for Latin American Anthropological Research (http://www.flaar.org/), an organisation that he founded in 1969 to photograph the art and architecture of Latin America.